Yesterday morning I put my bike in the truck and rode with Rose to her work and then continued on my bike the rest of the way to work. As I mentioned in a earlier post, my commute went from ten miles to over seventeen and I normally don’t have enough hours in the day to make the commute. Yesterday was an exception because Rose wanted to go to her aerobics class after work so I was on my own to get home. I talked to my boss and arranged to come in early and take a short lunch so I could leave a little earlier. When I was leaving that morning I talked to my neighbor and mentioned what I was doing and he thought I was crazy. “It’s supposed to be 95 degrees today.” he said. He even offered to give me his number if I got into trouble but I really didn’t think my bike was going to fit in his Corvette. I was out of work and on the road just after 4:15. The weather was hot but after being cooped up inside all day I was happy to be out. I rode the familiar route home and stopped at Rose’s office for a few minutes to stretch my legs and then I headed home. This time I was riding a new route and didn’t know what to expect. From Rose’s office I had a few routes to choose from and I chose the most direct. It is seven miles west on a very busy road. The first few miles have no bike lane so, for safety, I chose to ride on the sidewalk. At least I thought it was safe but not long after getting on the sidewalk I was again struck by the curse of the clipless pedals. My front tire went off the edge of the sidewalk and the lip was to big to steer it back on so I tipped to the left. It was no big deal and putting my left foot out would have prevented a fall but I couldn’t unclip fast enough and down I went. The rest of the ride was uneventful except for a hill that seemed to never end. I kept thinking, “This is Florida, it’s supposed to be flat.” It really showed how spoiled I have been and how I really needed this challenge. Of course, the greatest part about a hill is that there is always a downside, and by that I mean an upside. I made it home just after 6:30. As I was turning into my driveway I waved to my neighbor who was pulling out in his Corvette. What a great ride. I want to do it again but I don’t want to push my luck and try to leave early too often. 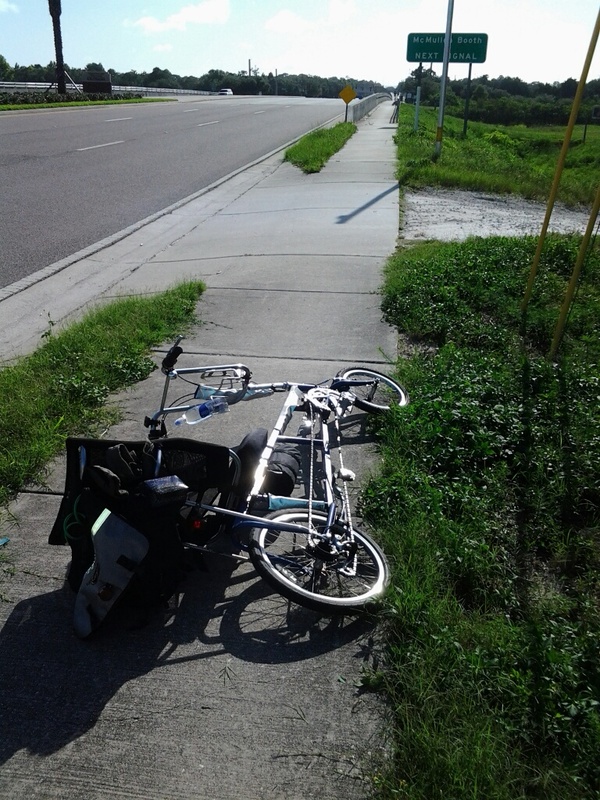 This entry was posted in Commute, exercise and tagged bike accident, commute, heat, new route, riding uphill on June 19, 2013 by Charles Huss.